MINSK/KIEV, Belarus/Ukraine -- Belarus restricted its airspace on Saturday and airports in Ukraine including the capital Kiev closed to flights because of the huge volcanic ash cloud drifting over Europe. 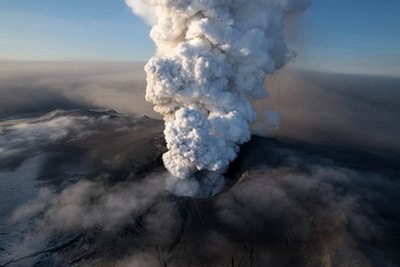 This aerial image shows the crater spewing ash and plumes of grit at the summit of the volcano in southern Iceland's Eyjafjallajokull glacier Saturday April 17, 2010. A lingering volcanic ash plume forced extended no-fly restrictions over much of Europe Saturday, as Icelandic scientists warned that volcanic activity had increased and showed no sign of abating — a portent of more travel chaos to come. Belarus closed its airspace overnight to flights at altitudes between 6,000 and 11,000 metres, but some routes east and south were open, the head of the aviation security department, Vladimir Nagulevich, told Reuters. Ukraine's Aerosvit airline said the main Kiev airport would remain closed until at least 1800 GMT and possibly into Sunday. Ukraine's Lvov, Odessa, Donetsk, Simferopol and Dnepropetrovsk airports were also closed to flights for an unspecified period. Europe's air travel chaos deepened on Saturday as the huge cloud of volcanic ash from Iceland spread further across the continent, halting nearly three in four flights and stranding passengers worldwide. Authorities in Belarus said they were offering to waive visa requirements for European Union citizens stranded in Russia and willing to return to the EU by road or rail through Belarus.